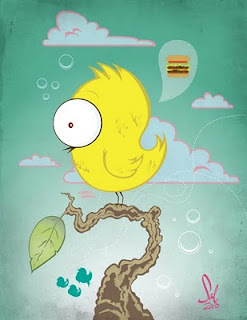 The Tanoshiboy Chronicles: Design & Illustration Blog: Cyclopee can haz cheeseburger! This is the first post under the new name, Tanoshiboy Chronicles. So welcome. There will be lots of changes to this blog. Obviously a new look, but the kinds of things I'll share will also be different. Sketches will still be a mainstay of this blog, but I'll also post works in progress and finished work. The idea behind tanoshiboy is to simply have fun creating and sharing. But for now let's go back to January and look at the before of this finished piece. This lil guy is one of my favorites.